Scraps is a unique textbook that allows your students to talk about what they really know–their own lives! In each unit, students improve their vocabulary, listening, and speaking as they look at a page from a model scrapbook. At the end of the course, students tear the scrapbook pages out of the book, attach the cover, and voila–they have their very own English scrapbook. Every unit also contains a culture corner so that students can learn about each topic in other countries. And for presentation courses, Scraps is ideal because students know their topic so well that they can focus on presentation skills and accuracy. 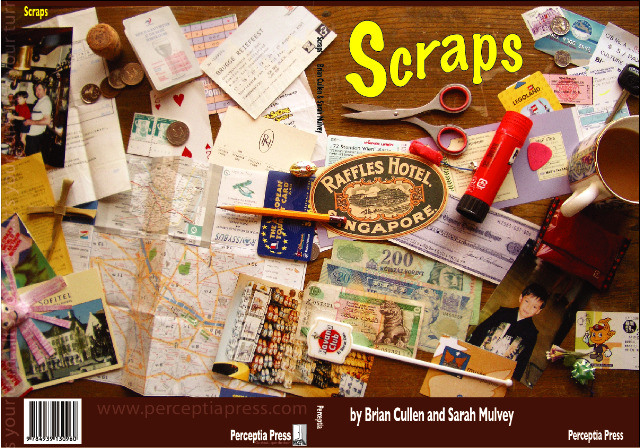 Scraps can be used as a main text or as supplementary material for a conversation, discussion, presentation, or research-based course. A full teacher's guide is available for this book as a free pdf. To obtain your copy, please contact Perceptia Press or your distributor. See a great slideshow showing Scraps in action.